STARTING OUT AS A CAMERMAN FOR CAAMA (CENTRAL AUSTRALIAN ABORIGINAL MEDIA ASSOCIATION) IN 1990, WARWICK THORNTON WENT ON TO GRADUATE IN CINEMATOGRAPHY FROM AFTRS IN 1997 AND THAT YEAR SHOT HIS FIRST FEATURE FILM, RACHEL PERKINS’ RADIANCE. 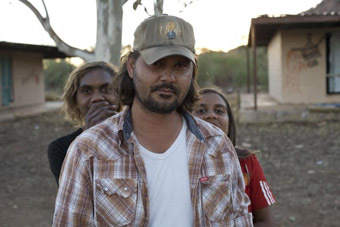 MORE FILMS FOLLOWED FOR FELLOW INDIGENOUS DIRECTORS AND HE DIRECTED A NUMBER OF DOCUMENTARIES INCLUDING ROSALIE’S JOURNEY, ABOUT ROSALIE GNARLA KUNOTH, WHO PLAYED THE TITLE ROLE IN CHARLES CHAUVEL’S 1955 FEATURE FILM JEDDA. HIS FIRST VENTURE AS WRITER-DIRECTOR, AND CINEMATOGRAPHER, OF SHORT DRAMA WAS PAYBACK IN 1996. THORNTON’S RECENT SHORT DRAMAS GREEN BUSH (2005) AND NANA (2007) HAVE BEEN ACCLAIMED LOCALLY AND AT INTERNATIONAL FILM FESTIVALS. GREEN BUSH WON BEST SHORT FILM IN THE PANORAMA SECTION OF THE 2005 BERLIN INTERNATIONAL FILM FESTIVAL AND NANA WAS AWARDED A CRYSTAL BEAR BY THE JUNIOR JURY OF THE 2008 BERLIN FESTIVAL. Warwick Thornton’s Samson & Delilah is an impressive feature film debut (see review), evidence of a filmmaker on top of his craft. I interviewed the amiable Thornton shortly after the film premiered at the 2009 Adelaide Film Festival and won the Audience Award for Best Film. His love for his film and for his principal characters was palpable, as was the certainty of his vision and the care entailed in his craft. KG I really enjoyed the film. It’s a wonderful account of love and the way it can evolve really quite slowly and incidentally, right from the first stone Samson (Rowan McNamara) throws at Delilah (Marissa Gibson) that hits her in the back. You think what is this, does he hate her or is this courtship? KG It’s a shocking moment, well into the film, when Gonzo (Scott Thornton), the itinerant, provokes Samson to actually speak. WT And it’s just a stutter. Maybe Samson has a disability that he tries to hide. KG Perhaps it’s because he hasn’t spoken for so long. KG She’s pretty well lost the capacity to talk because of all she’s been through. She’s not a great talker anyway, she watches, especially that great moment she watches Samson dancing in the night. WT She’s always watching the world. Her ideas are represented in the Mexican music (Anna Gabriel), more a fairy tale version of love she’s yearning for. But all she’s got is this mad boy. Nobody’s sure of what he is, but when she looks at him and has that music in her head, there’s this connection. KG I think the sound is fabulous (David Tranter, location sound; Liam Egan, sound design) and the way you’ve used the music. At times we only hear what Samson’s hearing when the rest of the world is going to pieces. It’s a sound-conscious film in the best possible way. KG Obviously you spent a long time conceiving the film and seeing it in your head. Did you storyboard it extensively or script it? WT I actually don’t like writing, the physical side of it. I don’t type. I write with a pencil and a pad. And it’s quite painful for me to do that ‘cause I can’t spell very well. I left school in Year 6 and I didn’t learn that stuff very well. So what I do with films is I think about them for bloody years until I’ve got beginning, middle and end, all the characters, their journeys—you know, not incredibly succinct but just the real scene one, scene two, kind of thing, this happens, that happens. So I’ll think all of that in my head and then I’ll sit down for three or four days and actually write the whole thing. Twenty pages a day. Twenty pages of my handwriting translate into about twelve or thirteen typed pages. And this script I think was about 60 pages long. So that whole idea of a page a minute never works with me. KG So you transcribe what’s going on in your head onto the page. WT Yeah. And re-drafting is just adding. It’s never taking away and re-building the whole thing. I’ve got the nuts and bolts, the total structure down, so it’s just adding nuances or scenes that play out later or are revisited later, and starting to get a bit more weaving happening. KG So there’s a very strong framework when you’re on location? WT This film is pretty well to script. I added one scene that wasn’t written and there’s nothing deleted. I had to be incredibly strong about each scene. Because there’s mostly no dialogue, those little looks and movements or whether they’re going right to left or left to right, all that sort of stuff had to be absolutely down pat. The scenes can’t hide in dialogue. They have to work and they have to pay off for the next scene to happen. So I had to be really careful about the written word and it being translated to the screen. KG Were you shooting in sequence? The characters go through some devastating physical changes. WT Absolutely. We pretty well shot everything in sequence because of Samson and Delilah’s downward journey. As well as we designed Rowan’s clothes to get baggier so it looked like he was getting skinnier, so they appeared to drip off him at the end. All of that stuff was quite complicated, so to shoot in sequence was quite important, and for Rowan and Marissa because it was the first time they’d acted. The journey needed to be in sequence for them as well so they knew where they were. Maybe five films down the track they’ll be able to start at the end of the film, go and do the middle and then the beginning—but not for those two this time. KG What about yourself with the camera? Did you feel at all schizoid? WT It was fantastic. I filmed and operated and the whole thing is hand-held as well. I decided to shoot it myself because the cinematography in it’s not really demanding. It was quite natural. Everything is lit but we’ve lit it to make it look like it’s not lit. And if I’ve got the camera right there and Rowan and Marissa are right there, well we’ve got a connection rather than: there’s a cameraman, and a dolly and three grips and some gaffers. And then there’s this BNC cable around the corner and out on the street where there’s the split and I’m out there and I’m yelling things at them and running in and out and all that sort of stuff. You know, I had to completely get rid of that. And because there was no dialogue and I had a lot of soundscape ideas while we were shooting, I could actually just talk to the actors while I’m rolling: “Speed it up a bit.” “Pick it up with your left hand.” “Get a bit angrier.” To be there with the camera and talk to them, one-to-one, was priceless. KG What was the editing process like? WT I’m a real believer in letting an editor spend a couple of weeks or even a month or two finding the film for themselves. I like that idea that they’ve read the script, they’ve watched all the rushes, they’re editors and they’re incredibly good at structure. None of the structure in the film actually has changed but for them to go and create a rough cut and to learn and to own the film I don’t even rock up for the first month in the edit suite. Then you come in with your idea of your baby but you feel these new fresh ideas that the editor has created as well. Roland Gallois cut it and he’s cut all my films. And we have that amazing trust because he’s such a beautiful editor. There’s 60% where I say, ‘Roland, that’s terrible; you don’t know what you’re doing’, but there’s 40% where he’s completely changed stuff and you go, ‘Wow, I’ve never seen that, never thought of that scene in that way.’ He’s created this absolute magic, stuff you didn’t realise was there, because you are so close to the film. And that’s the stuff you keep. And then the other stuff you don’t think is working you just build to the way you think it should be. KG The sense of place was very strong in the film, of a community seen from the characters’ points of view—Samson when he’s walking or Delilah looking out over the fence or through the car window. WT It was really important with this film to not use the classic Hollywood cutting away to a different character or story or playing too much with that kind of time. Everything that happens in the film we feel at exactly the same time as the characters see it. You’re on the journey with them. If you cut to another scene and a car’s coming or something else is happening, the audience has become disconnected and they’re on some other journey. With this film it was really important to stick with the characters and nothing was pre-empted. It’s important for the audience not to know what the hell is coming up; it’s an uncomfortable place and that’s what we wanted. WT It was interesting, that priest. I’d written this really bad piece of dialogue, you know, “Get out, get out!” It was horrific. I’d always hated it through all the drafts. I thought, alright, I’m gonna change it, and I never got around to doing it. In the afternoon we were doing the scene and I thought oh God, what am I gonna do? I’m gonna have to re-write this now while everyone’s having lunch. I thought, “Of course, I know what to do, we’ll just get rid of all the dialogue. He doesn’t say anything.” Because of that, some people see the priest as this sort of incredibly concerned person who doesn’t know what to say and some people see, another bloody useless priest who’s not gonna help. And that’s fantastic. KG Samson and Delilah go through hell, but you give them another chance. WT I’m one of the biggest romantics in the world and, from day one, these two kids had to live. That was the most important thing. It would have been quite easy for them to die and that’s just wrong, that is so wrong. I couldn’t live with myself as a writer. I need them to live for me as a human being, to feel stronger. KG And it’s such a lateral solution you offer, because neither of these kids has a community, do they? They’ve been tossed out. It’s pretty tough and you make it tougher. WT They have to really cleanse themselves. KG They’re not rescued by priests or social workers . WT No. There’s lots of good priests and good social workers. There are things in place. But it’s just these kids’ journey. They’ve actually made those choices. No-one’s forced them. They could’ve actually lived in the community if they wanted to. It would have been a lot harder ‘cause they’ve nicked the car and everyone’s really pissed off with them. They could have lived there but they’ve decided. KG There’s a beautiful stillness in Marissa Gibson’s performance, whereas Rowan MacNamara is a lot more literally expressive which makes for a nice combination. WT And she grows. That was all written, not her stoicism but her ingrained stability and strength because of her looking after her Nana and having these really important things in her life. Samson has nothing. It’s Delilah’s struggle, she really wants to make it work when he’s still not making it work. You’ve got to go to the really darkest place before you realise how beautiful the light shining is. And that’s the end of the film. She’s so incredibly strong and she’s 14 years of age and she’s living the life of someone who should be like 35 and all knowing about the world, or 65. Samson & Delilah is screening May 7 for Message Sticks Festival, Sydney and released in cinemas nationally on the same day.